According to Dr. Philip Callahan, rose granite -- which was used in the construction of the Kings Chamber of the Great Pyramid -- is one of the most paramagnetic substances he has measured. Limestone, which covered the Great Pyramid, is diamagnetic. The cone shape and the pyramid shape are often considered to be energetically equivalent. Both are said to generate a spin field from the apex. "The big secret of alchemy is what's known as the 'secret fire,' something that can, over time, dissolve gold into a white powder. It is said that the whole process is completed by this 'fire' without human interaction. It is also said that the process is 'child's play,' and it is. The secret fire which dissolves gold is an energy emitted by a pyramid shape. Not very surprisingly, the word 'pyramid' is translated as 'fire in the middle.' As I am writing this, I have a one ounce Canadian Maple Leaf gold coin hanging in the middle of a pyramid that I made from eight five-foot sections of copper pipe which form a pyramidal frame. The coin is exuding a liquid which dries into a white powder. It is not condensation as the coin is at air temperature, and the humidity is low. I have cleaned the coin, and the liquid/powder reappears. This is not a normally reported property of gold, but it is quite consistent with the first step of the alchemical process, obscurely related in the texts I have studied." [BARRY] Why do you call it fly ash? [JIM] Because when you'd reach for it, it would fly away. [BARRY] What do you mean by that? [JIM] When you reach for it, it moved away. That's it. [BARRY] Where did it move? [JIM] Anyplace it had to; up the side of a jar, out of a pan. Unless it was wet you couldn't handle it. But if it was before the charcoal was added, like in that clay water, that stuff froze and gave us that double pyramid. That stuff was filled with that gold, because when we nuked it that was the first time we saw stuff volatilizing out of the solution. That was a solution of the silt right below their final settling pond gate before it went out back into the creek, which was plenty muddy. [BARRY] Was it a flat pyramid or steep? [JIM] I don't think it was the same proportions as your regular pyramid. The height was about equal to the base. It was at Tracy's house where we noticed it. Because it was sitting outside; out by his garage and one of the kids walked by and saw it and said "ooh look at this". Because a pyramid was like that way and a pyramid was like that way [indicated that one pyramid was upright and another was upside down with gold between the bases] and there was that little colloidal gold, murky layer in the middle; between the two. [JIM] Colloidium form monoatomic organic materials and that's stereo chemistry represented. Which is a mirror image of the other one. And they at random create in equal amounts. If you spin water in a vortex inside a strong magnetic field you can get a portion of the water to levitate out of the field. 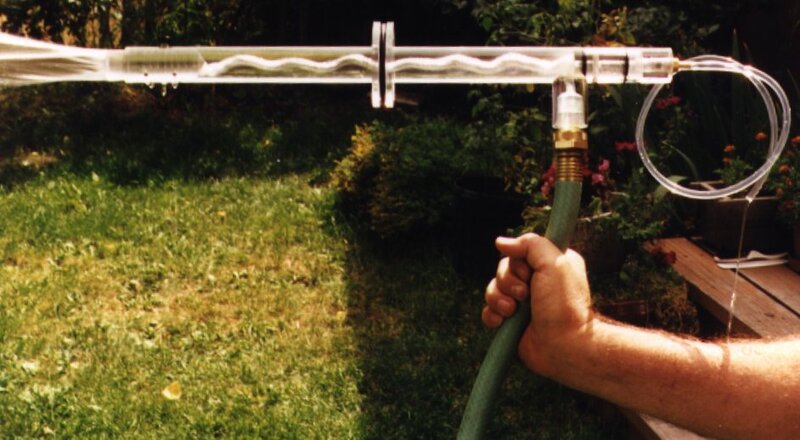 Using a "trap" based on this principle one can concentrate this kind of water. This water has a sweeter taste than ordinary water, it has an oily feel and it contains a higher percentage of the ORMUS elements. The "good" water is measurably different from ordinary water in that an "oil" can be extracted from it using a solvent like ether. This is the alchemists "oil that doesn't burn" and they say it is the universal solvent; it will even dissolve gold. I believe that the Great Pyramid was designed to be a "Swiss Army knife" like tool to manipulate consciousness and matter. It may have been designed to be a "trap" for the ORMUS elements from air. It may also have been designed to convert metallic gold into ORMUS gold and it may have been designed to concentrate these ORMUS elements in the King's Chamber so that people could use these elements for spiritual purposes. "It is but a short step from psychokinesis (moving a body sidewise) to levitation (moving a body upward). I am firmly convinced that the pyramids, both Egyptian and Central American, were huge antigravity structures for levitating the priests. 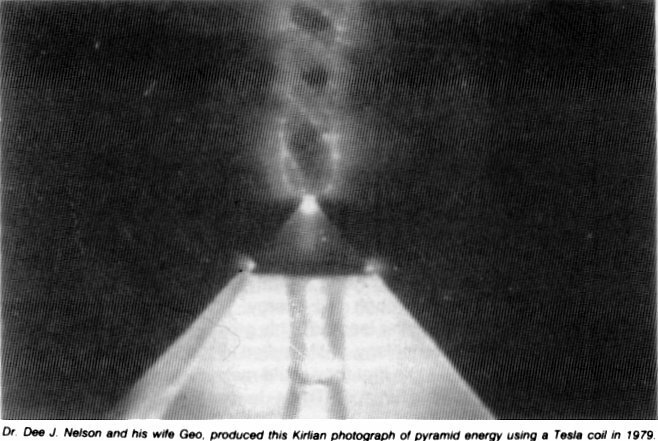 The pyramid acted like a huge "enlarger-type" condensing lens which concentrated the cosmic energy into the hollow resonant stone tower, which in turn was filled with the IR-paramagnetic, organic breath of chanting priests. If my belief seems farfetched, then perhaps the "picture" language of the Egyptians themselves should give one cause to reconsider. There are quite a few Egyptian wall reliefs that show a Pharaoh lying on a sphinx-like stone couch. In the next accompanying relief, the carving shows the Pharaoh six inches above the surface of the couch with a sacred kestrel hovering above his outstretched body. Remember the kestrel is one of the few large birds that can hover in a fixed position in space." "I have been working with paramagnetism for years. I not only discovered good soil to be paramagnetic, but likewise refined beeswax. That later discovery indicated to me that since insects are coated with wax, their antennae are paramagnetic structures. The next bit of reasoning followed from my insect work and it involved asking the right questions about religious structures such as pyramids. The right question is, "Since insect sensilla have definite shapes for resonating to different infrared wavelengths, do the various shapes of stone religious structures indicate that they resonate to the paramagnetic forces of the cosmos? In other words, can they collect and concentrate the paramagnetic cosmic force above what would normally occur in unshaped soil and rocks? The answer is yes, and inside that King's Chamber at Giza I proved that without a shadow of doubt. In my work with Irish round towers, I developed model smooth and corrugated round towers that respond to the paramagnetic-infrared aura of the human body. Pink granite is the most paramagnetic stone that I have ever measured-with an instrument called a magnaprobe. The inside tower chamber of the Great Pyramid is constructed from beautiful pink granite. Each of the giant pink granite lenses (tower floors) act to focus the cosmic paramagnetism down (like light waves) into the King's Chamber. The outer limestone portion of the pyramid serves as a giant condenser lenses in a photographic enlarger-to diffuse and concentrate paramagnetic waves. Of course, the outer, smooth, tura limestone casing of the Great Pyramid has been destroyed so it will never again stimulate total levitation of a heavy body. My round tower sensors will, of course, move sideways to a human body (telekinesis) anywhere on the earth. The arc of movement in my house is 60-70 degrees, but in the King's Chamber it moved 200-300 degrees in a steady sweep to the human aura. The sensor was five to ten times as sensitive inside the chamber as inside my house in Gainesville, Florida." 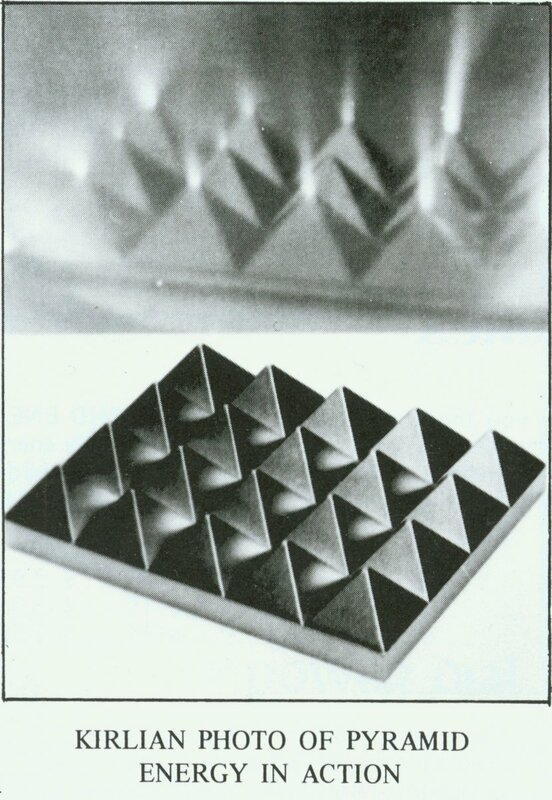 "I got Flanagan’s permission to make molds of his original pyramid grids. I put a 5” speaker magnet under the grids then put the white-gold containers on top of the grid and leave em there for weeks. I also use the grids to charge drinking water." The mfkzt is probably related to the Biblical manna and shewbread which may have been charged in the Ark of the Covenant. According to Peter Thompkins the Ark of the Covenant has the same inner volume as the sarcophagus in the Kings Chamber of the Great Pyramid. Thus, both would have a similar resonant cavity. You will soon pick up an active zone, a "clot", where the Egyptians had their tombs. Another active zone (a flame) above the top of the pyramid is also well-perceived by the indicator if you drag its end over the top. 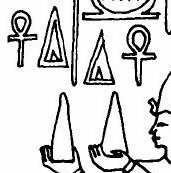 The "clot" and the "flame" are well-felt by the finger inserted into he pyramid, or your palm moved above it after some practice. The pyramid effect, which generated many scary and mysterious stories over the centuries, is one of the CSE manifestations. Cup your hands into a tube (see picture) and point your hands from a 2-meter distance at the suspended pyramid (do not lose your "target"). The pyramid will eventually start rotating clockwise in a few minutes under the pressure of this beam of CSE energy. According to the Zohar, the ancient Jewish priests would tie a rope around the ankle of any priest who was going into the presence of the Ark of the Covenant so that they could safely pull him away from the Ark if it zapped him. The Ark of the Covenant was used to store (and perhaps charge) the pot of manna saved by Moses. "An engineer and former professor of radio, L. Turenne, maintains that all sorts of different forms being combinations of different frequencies act as different types of resonators for energy in the cosmos. This has led to speculation that the Pyramid might be some sort of gigantic lens which is able to focus an unknown energy simply by means of its shape. Even the coffer In the King's Chamber has been considered such a device by Worth Smith, who points out that the cubic capacity of the coffer is exactly the same as that of the biblical Arc of the Covenant. According to Maurice Denis-Papin, descendant of the famous inventor, the Arc of the Covenant was a sort of electric capacitor capable of producing an electrical charge of 500 to 700 volts. The Arc is said to have been made of acacia wood, lined inside and out with gold: that is to say, two conductors separated by an insulator. On either side were garlands which may have served as condensers. Denis-Papin says the Arc was placed in a dry spot where the magnetic field reached a normal 500 to 600 volts per vertical meter. Insulated from the ground, the Arc is said to have given off fiery rays, acting like a Leyden jar. According to Denis-Papin the capacitor was discharged to earth by means of the garlands. To move the Arc, two golden rods were slid through rings attached to the exterior. 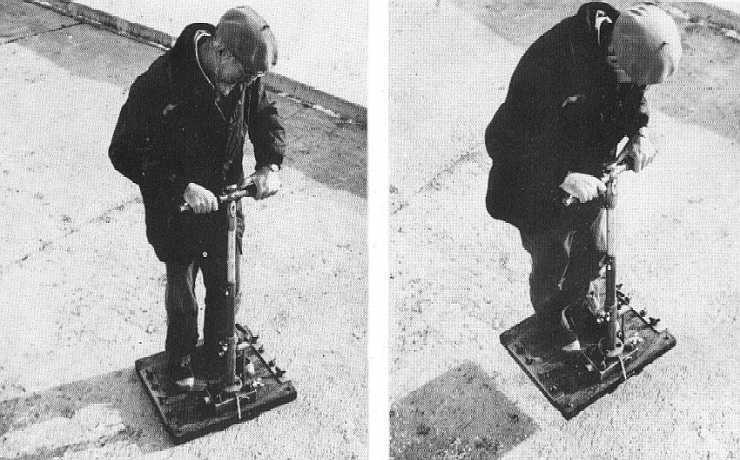 The similarity of such an "energy accumulator" to the orgone box developed by Wilhelm Reich, which was such a puzzle to Albert Einstein, is also striking. Sir W. Siemens, the British inventor, related that one day while he was standing on the summit of Cheops' pyramid an Arab guide called his attention to the fact that whenever he raised his hand with his fingers outspread an acute ringing noise was heard. Raising just his index, Siemens felt a distinct prickling in it. When he tried to drink from a wine bottle he had brought along he noted a slight electric shock. So Siemens moistened a newspaper and wrapped it around the bottle to convert it into a Leyden jar. It became increasingly charged with electricity simply by being held above his head. When sparks began to issue from the wine bottle, Siemens's Arab guides became distrustful and accused him of practicing witchcraft. One of the guides tried to seize Siemens's companion, but Siemens lowered the bottle towards him and gave the Arab such a jolt that he was knocked senseless to the ground. Recovering, the guide scrambled to his feet and took off down the Pyramid, crying loudly." If I were to guess the purpose of the Great Pyramid I would have to call it a multi-purpose research instrument that gets its power by squaring the circle of the earth. "Next to the altar was the table "whereupon the shewbread was" (I Kings 7:48; II Chronicles 4:19). The showbread was obviously not of flour, but of silver or gold; in the Book of Exodus 12 it is said that showbread was made by Bezaleel, who was a goldsmith." 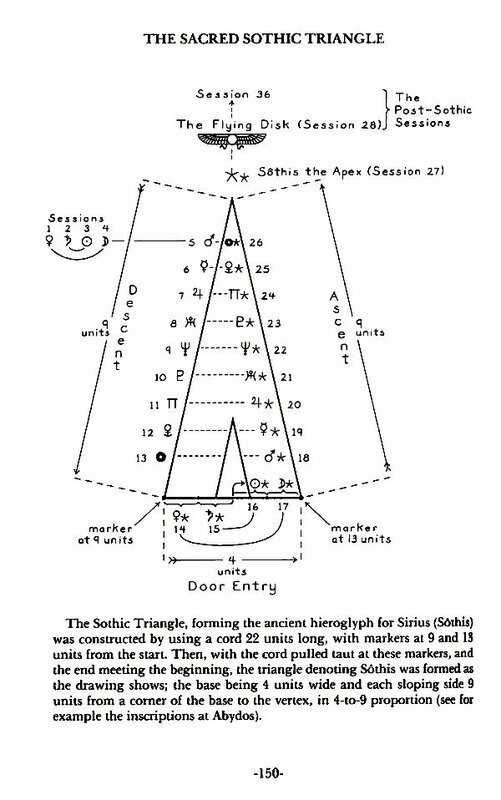 "The Sothic Triangle, forming the ancient hieroglyph for Sirius (Sothis) was constructed by using a cord 22 units long, with markers at 9 and 13 units from the start. Then, with the cord pulled taut at these markers, and the end meeting the beginning, the triangle denoting sothis was formed as the drawing shows; the base being 4 units wide and each sloping side 9 units from a corner of the base to the vertex, in 4-to-9 proportion (see for example the inscriptions at Abydos)." "I had discovered that round towers are indeed high tower ELF radio antenna paramagnetic amplifiers. More astonishing yet, I discovered the ancient Irish monks of the 5th to 9th centuries were rock antenna radio engineers. Most round towers of Ireland are now without floors or ladders, however, I was able to visit the tower on Scattery Island where the door is at ground level. Inside I discovered that without even touching my jute-saltwater cord to the walls, that at the center there was a two- to four-time increase in the strength of the waves. The 8-Hz and 2,000-Hz waves always came in strongest at dawn and dusk. I recorded the same ELF phenomenon in so-called megalithic tombs and even found a megalithic pictograph of a target wave on the side of the chamber at Loughcrew." Please note that these round stone towers had conical roofs. Large Cones with an artificial comb filling and three magnets at the back. Two similar cones were positioned against each other with respect to the sun, one in Isilkul and the other one near Novosibirsk. They were thrown appart and demolished on the moring of April 23, 1991. The one in Novosibirsk was unfolded and pressed into the wall of an underground hiding place and its magnets disappeared. Some residents of an Omsk apartment experienced a series of strangest "poltergeists" (see Vechernii Omsk from April 26. and Omsk and Moscow TV broadcasts) at the same moment. The same paper called the device in the picture "Grebenikov's hyperboloid on August 5, 1991. exactly because of this "coincidence". One of the "beams" of the upright electronic waves between the two conical structures may have actually been formed precisely there, on the river Irtysh embankment in Omsk. In this movie you will see the ORMUS gold change from a paramagnetic material which follows the magnet to a diamagnetic material which is repelled by it. We postulate that the ORMUS gold is a superconductor which is attracted to the magnet at first but, as the Meissner effect builds, begins to exclude the magnetic field and jumps away from the magnet.